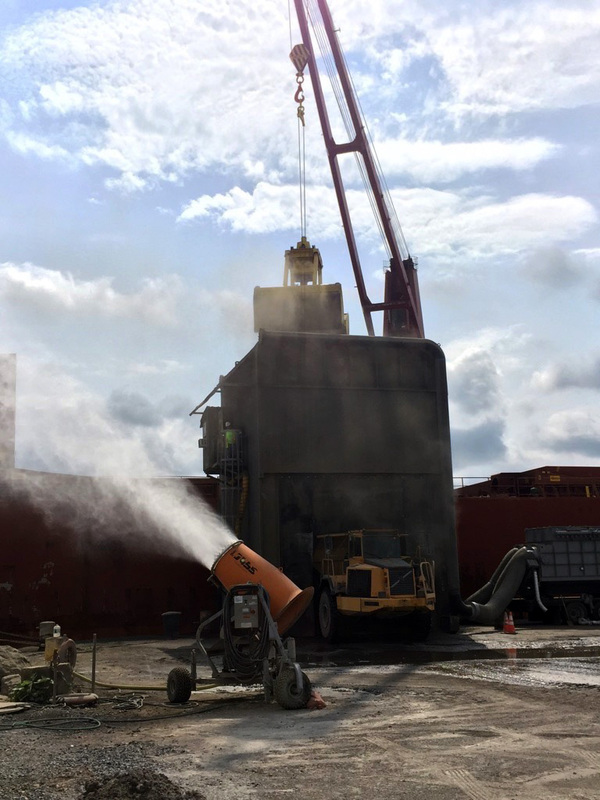 Peoria (IL), United States – A leader in dust control solutions has helped a port located along the Hudson River control fugitive particle emissions at the dock and in the industrial park using atomized mist technology. 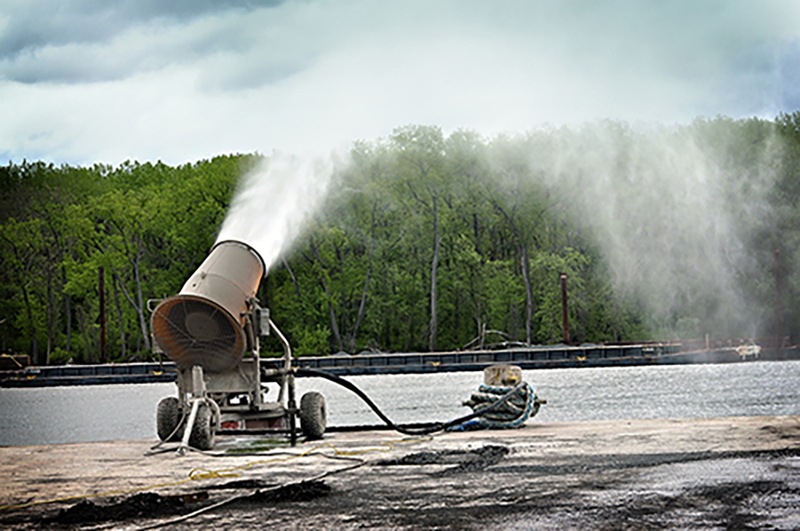 The Port of Coeymans employs two DustBoss® DB-60™ atomized mist cannons from BossTek® for dust suppression in a variety of activities​ and applications. One machine is mobile, used to control particle emissions during the unloading and storage of bulk materials. The other is tower-mounted to suppress particulates at the metal scrap yard. This provides operators the versatility to address surface suppression and airborne control at different areas of the port, resulting in a drastic reduction in fugitive dust. 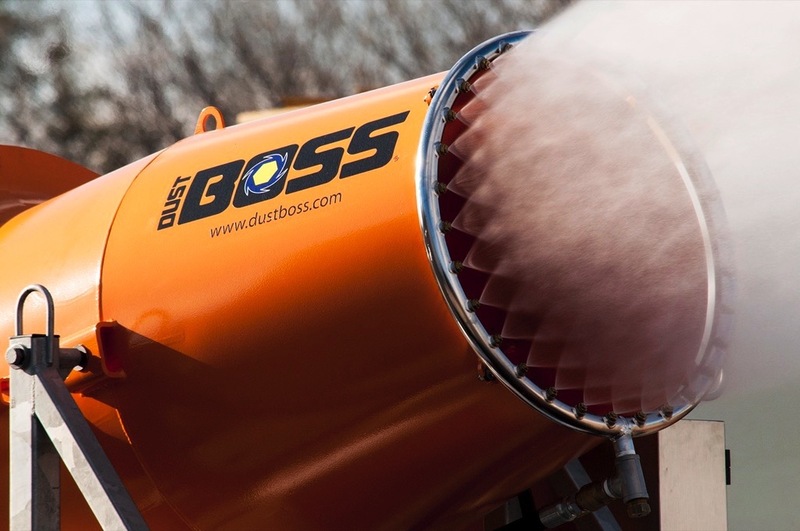 The compact size of the DustBoss allows easy positioning, and it can run continuously unattended. About 40-50 vessels per year arrive from Greece, Turkey, Egypt and Spain, delivering nearly 33,000 tons (30,000 metric tons) per week of clinker, a dry chalky substance used as a binder in cement products. When the ship arrives, large clamshell shovels controlled by tower cranes unload the material from the ship’s cargo hold, over the ship’s deck – from 25 to as high as 120 feet (7.5 to 36.5 m) in the air – to a 20-foot-tall (6 m) hopper, which discharges into a 40-ton (36 metric ton) haul truck. The truck drives the material the short distance to the adjacent industrial park, where it is stored for further transport. Dust suppression is directed where it is needed most in the unloading process. The 300-foot (91.4 m) wide dock receives vessels of up to 750 feet (228.6 m) in length overall (LOA). With no beam restrictions, it accepts ships with a draft (depth) of 31 feet (9.4 m). In addition, a 300-foot by 60-foot (91.4m by 18.3 m) inlet channel with a 15 foot (4.5 m) draft allows loading/unloading from both sides. 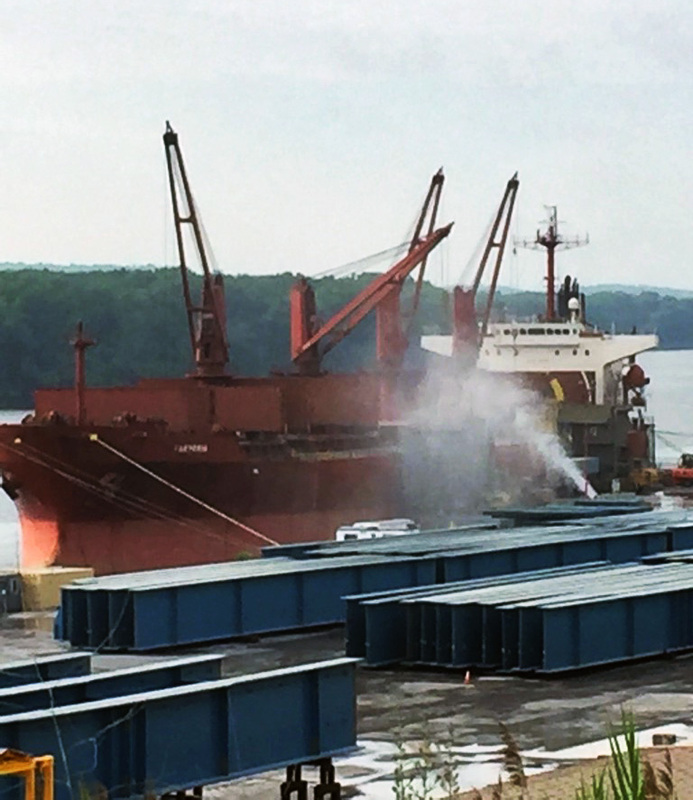 Like many other facilities handling bulk materials, the Port of Coeymans limits fugitive dust emissions by employing a couple of simple methods. One is limiting the distance the dust-emitting cargo travels from the ship’s hold to the dock. This is done by using a clamshell shovel suspended from a crane to slowly unload the material into a tall portable hopper with a baghouse dust collection system. To further mitigate dust, crane operators reduce the amount of material collected by the shovel. Although this extends the unloading time, it curbs the amount of material escaping from the top or sides of the shovel and thus further limits dust emissions. Another area that needed dust suppression was in the industrial park. Located about 700 feet (213 m) inland from the Hudson River with no natural wind barrier, the surface is a combination of concrete, packed earth and gravel. Scrap metal from various sources (demolition projects, old cars, dismantled ships, etc.) is transferred from barges and deposited into storage piles. During windy conditions, the unprocessed metal can emit dust both during offloading from vessels and loading onto ground transport. 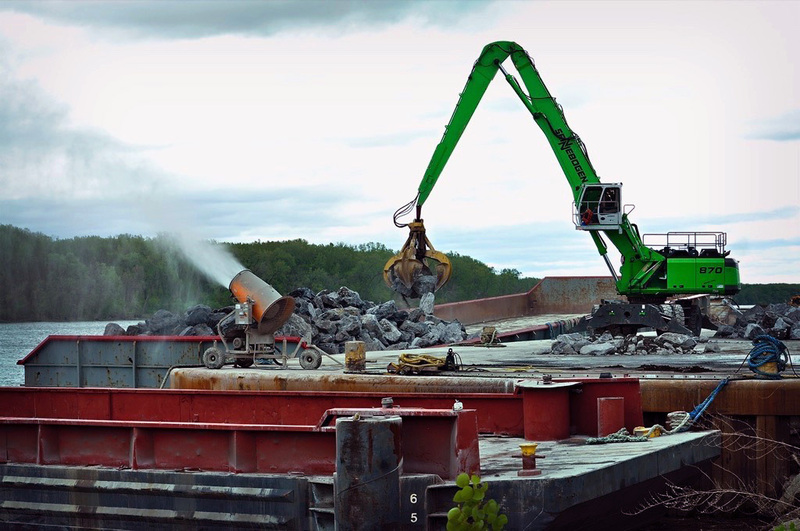 Mounted on a tower, the DB-60 suppresses dust over metal scrap recycling piles. The industrial park also stores mounds of various raw commodities. These well-organized piles, stretching as high as 20 feet (6 m), are exposed to outdoor conditions and can emit dust in moderate winds, during offloading by haulers, disruption by front loaders and loading into trains or trucks. Additionally, this heavy ground equipment can kick up its own dust during normal operations. Kelly contacted BossTek , manufacturer of the DustBoss series of industrial atomized mist cannons and decided to rent two of the mid-sized DB-60 units to test them out. Mounted on a heavy-duty wheeled carriage with a pintle hitch, the DB-60 has a specially designed barrel with a powerful fan on the back end and a circular manifold with 30 atomizing spray nozzles on the front. The fan forces air through the cannon and past the manifold, launching millions of tiny atomized mist droplets 50 to 200 microns in size. By introducing droplets roughly the same size as the dust particles, the droplets are able to travel with the particles, collide with them and drag them to the ground before they drift onto the dock area or across the site line. The mist can be seen stretching across the deck to deliver efficient dust suppression. A 25 hp fan producing 30,000 cfm (849.50 m3/min) of air flow propels the engineered mist in a 200-foot (60 m) long cone that reaches high over the deck of the ship. This type of coverage offers simultaneous surface suppression to material in the cargo hold and airborne suppression through the shovel’s path from the hold to the hopper. The unit features a 200-foot reach, 359º oscillation and 50º vertical adjustment angle. Approximately the height and length of a standard golf cart and weighing around 1,800 lbs. (816 kg), the unit is easily moved on its wheeled carriage by a pickup truck or fork lift from the port to the industrial park. There, operators can cover more than 125,000 square feet (11,613 m2) of the storage and traffic area using the 359º degree oscillation. 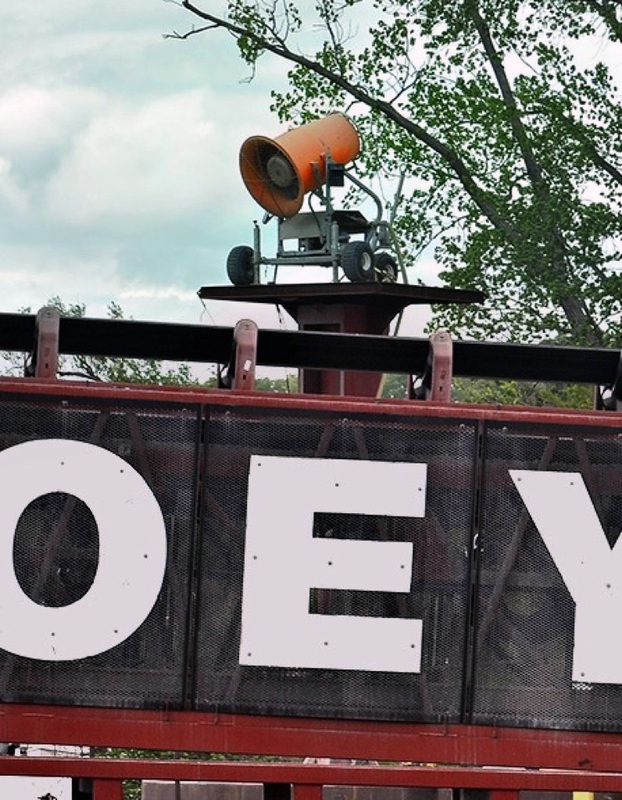 The Port of Coeymans uses municipal water through a hose with a cam-and-groove quick disconnect coupling leading to a booster pump that raises the pressure up to 160 psi (11.03 bar), with a maximum of 250 psi (17.23 bar). The unit only requires a constant supply pressure of 10 psi (0.069 bar), and when a non-potable water source is used the DB-60 can be equipped with an in-line 30 mesh, 595-micron filter system. The DB-60 combines a specially designed ducted fan with an atomized misting ring to deliver wide coverage. There are some clear benefits over the use of hoses, which are required to be manned and can use up to 100 gpm (378 l/min). The DB-60 uses far less water (only 26.7 gpm /101.1 l/min), delivering a much larger coverage area and requiring no labor for ongoing operation. Workers at the port simply place it in the desired location, point it in the right direction, hook up the hose and power, turn it on and walk away. Operators report that air quality at the port has significantly improved during the unloading of clinker and other dusty materials, and that fugitive dust emissions have not been seen leaving the site since adding the units to the facility’s dust management plan. The cannons are easily positioned on the dock, taking up little room and covering a large area, allowing crane operators to transfer material from hold to hopper more efficiently. The industrial park has experienced a noticeable improvement in air quality, especially when a DB-60 is in operation during dry and windy periods.